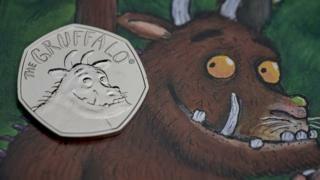 The Royal Mint has released a series of very special coins to mark the 20th anniversary of the beloved children's literary character, the Gruffalo. The coins will not go into general circulation though. 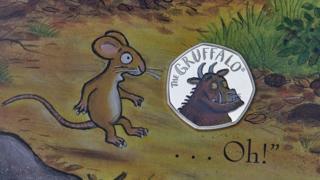 The Royal Mint has released a series of special coins to mark 20 years since the creation of the famous literary monster, the Gruffalo. Nicola Howell from The Royal Mint said: "Over the last 20 years, the Gruffalo has become one of the most famous children's characters in the world. We felt it was only right we celebrate the 20th anniversary of the book being published to feature him on a commemorative coin." The coins have been made available in three different finishes, but they will not be put into general circulation like normal money that people use every day. The coins will have to be purchased especially (and they don't cost 50p!). They are likely to become highly collectible as there won't be many of them around. The gold version - the rarest of the three finishes - will cost £795, with only 600 available to buy. 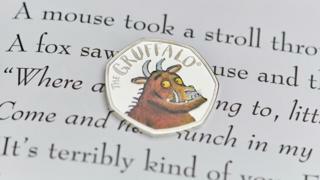 Author of the Gruffalo, Julia Donaldson, and illustrator Axel Scheffer presented the new coins. Julia said: "I can't believe it has been 20 years since The Gruffalo was first published. 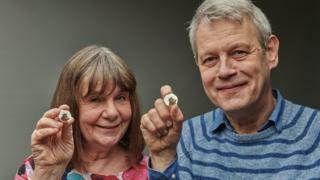 In that time, he's been brought to life on stage and screen, featured in nature trails, library cards and book tokens and turned into a soft toy, and now he's got his own 50p coin." It is not the first time that a children's character has featured on a special commemorative coin. The Royal Mint has recently produced a Beatrix Potter character collection, as well as coins featuring Paddington bear and the Christmas favourite The Snowman. 50p coin: After 50 years of 50 pences, how well do you know your coins?